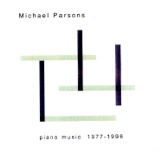 We are pleased to re-issue Michael Parsons’ Piano Music 1977-1996, a comprehensive collection of pieces performed by the composer. They exhibit the typical qualities of his music; economy of material, clarity of structure and an objective approach to the actualities of sound and performance. This is an important document in British Experimental Music, and EMC are proud to be able to distribute it. £10 + p & p.